Home Gun Articles Should You Unplug From Your Ballistic Calculator? Tools of the trade on display. Data provided before shooting is unproven. Not practical to expect 1-MOA accuracy before shooting. Doesn’t account for the human element — how you shoot. Blows some variables out of proportion. You need to dope your rifle to gather actual data. The need to focus more on the fundamentals of marksmanship. Every single day, I’m fielding questions regarding ballistic software. And here’s the problem: People go out to the range with software in hand and can’t quite understand why it’s not matching their setup, or they have trouble “truing” that software after the fact. The Sniper’s Hide Forum is full of people struggling with ballistic software errors. There are several reasons why your software might not line up correctly, but part of the problem is using the software first and not doping the rifle before exploring the ballistic calculator. When using the software before shooting, I call anything the computer spits out as “try dope,” because you’re just trying to touch the target, not much more. It’s not practical to expect 1-MOA accuracy beforehand. Remember, the manufacturer’s drop data was designed to get you on an NRA 6×6 target board — it’s up to the shooter to fine-tune that drop to hit the center. We never questioned it, and we just knew we needed to put in the effort. It’s just a starting point. My argument has always centered on the human factor. No amount of tinkering with software can account for the human element, and this has a much bigger say as to where the shot hits versus an untested solution. Simply put: It comes down to recoil management. It’s why one shooter will hit using Solution A; the next shooter needs Solution B or C. How they manage the recoil matters, and it’s why your zero and your friend’s zero are inches apart. No software out there considers you — it only finds an empty, near-perfect world. Measure the distance from the center of the bore to the center of the scope when inputting this data into your ballistic solver. The default setting of 1.5 inches is not correct. The next problem involves the promotion of “drifts.” We have a lot of new data that points to a series of drifts that can affect the placement of the shot, and the promotion of these is a relatively new phenomenon. When I went to Sniper School back in 1986, we didn’t worry about spin drift — it wasn’t even mentioned — we didn’t worry about Coriolis, cross-wind jump or any of the other examples we see today. Today, there are about four drift factors that are discussed, and some people start employing a correction for them as close as 400 yards. Am I saying they don’t exist? No — but I am saying they’re blown out of proportion. I think much of it is used to take the blame away from the shooter. If we gather our dope by walking our shots out — actually shooting each yard line distance and recording the data — we include everything. All the drifts are built into that number. There’s no such thing as a “no wind day.” If you experience one, consider yourself lucky … but practically speaking, no wind doesn’t exist. If it did, Coriolis would not exist. So, under normal circumstances, we zero and dope our rifles with everything already included. Then, when we go to our “data on previous engagement,” it’s taking into account these factors. We have a lot of tools to gather information on the firing line. Do not go into information overload trying to use them all at the same time. Let’s say that, today, I’m shooting to 1,000 yards and used 7.4 mils of elevation to hit center along with 0.75 mils of wind for a 5 mph breeze, that assumes all the drifts and drop data is in there. If conditions change because of the location or atmosphere, a computer will help account for it rather than the old, outdated rules of thumb. Still, hitting the target usually happens. We see this every week in tactical rifle matches around the country. Guys travel from their home location to ranges 500 miles away — and they hit. Why do they hit? They practiced and recorded their dope. Talking to several high scoring PRS shooters, they strive to nail down their data so elevation is a given and their only question becomes wind. In known distance courses, they consider this information their “zero” data. They essentially re-zero the rifle for each yard line. Employing the processes above, the wind has become the most significant drift factor we have, and it will actually offset some of the other drifts. Drift influence still depends on the direction and speed, but it will cancel out or increase several of the other factors. So, it’s important to understand the wind. There’s no dispute that you need to know what’s going on with the current wind because it can control so much of how we hit the target. There are a lot of ballistic solvers on the market. Many have features common to the others. Find the one you like. This also includes elevation changes. It’s not uncommon to have a terrain feature in or around a specific yard line that causes an elevation issue, so even if everything with the computer lines up, your 700-yard dope might be off because the wind changes the flight path of your bullet at that specific location. It often has people scratching their head. Why does that one range not line up? Well, it could be the wind. Still, if we recorded our data, we know what the wind was doing, so if we doped the rifle in a 5 MPH wind, going to an 8 MPH is not like starting from zero. While they might say an 8 mph wind will move the impact 0.1 mils up or down, it’s only 3 mph we’re dealing with. We already accounted for 5 mph, so why add 8 mph on top of that? If you’re modeling the shot on a computer, I can see the importance of all this. However, it’s not the same as shooting it — not to mention that we miss out on adding our personal spin to the bullet. Poor fundamentals will not line you up with the model. All you need is your ammo and a hardcopy of your data to be successful. Let’s say you’re adding 0.2 mils of trigger hook to your shot and you want to call it spin drift — okay, but are we talking about the same thing. Why did I not use any and you’re using 0.2 mils with the exact same wind call? Fundamentals make or break a shot at longer distances. The point is, while all these factors exist, they’re not equally distributed among the shooters. We all release the shot in our own unique way. So, before you go adding all the drifts to your ballistic calculator, try doping your rifle first without any software. Develop your dope to distance and record everything, then true the software to what you shot rather than worrying about what the computer said before your first round went downrange. Then — and only then — go back and line up the solver. I think you will find the variations are much smaller than you realize. Solid dope is hard to argue with … we all know the bullet has the last word. A lot of our head goes into shooting a rifle. The human factor is the most significant variable we have to combat. Next to the wind, it’s the No. 1 factor. The fundamentals of marksmanship guide us in so many ways, and deviating from them can cause both vertical and horizontal variations in our shot placement. The Kestrel wind meter getting the wind speed on the line. I recently did a private lesson for a gentleman who shoots for a living. He ran into an incident where his confidence was shaken and needed a fresher course. Immediately during our “fundamental evaluation,” I noticed one of the problems, and the effect was that his initial zero was off by 1.5 inches low and left from center. We worked on his fundamentals together, and after only 40 rounds we were ready to head home. Before leaving the range, I had him check zero. His zero was right back to the center of the ¾-inch dot we were shooting, and we never adjusted his scope. That mental mistake was costing him 1.5 inches at 100 yards. It’s important we get out of our own head sometimes. If you shoot alone, you end up making numerous adjustments on the fly, never stopping to analyze the cause and effects. So, here’s an exercise that will force you to take the time to shoot distraction-free for a few series. 1. Put down the ballistic calculator, move the target back and paint it a dark color. Or, better yet, shoot it on paper where you cannot see bullet holes. 2. Placing a paper target beyond 400 yards is the best solution. This way you get a mix of elements at play, and you should not be able to see the holes appear. 3. Start off by doping your rifle for both windage and elevation, and do this based on your standard wind calls. In other words, don’t do anything different. It’s best if you engage in this drill first thing, so the calls are not only blind — they’re also cold. 4. Focus in on the target and shoot your group, slow fire. Focusing on body position, use of the support hand with the rear bag, and most importantly, focus on trigger control. If need be, record your call for each, but if you break your position, be sure to reset it properly and don’t just roll into the next shot. 5. Then, go downrange and analyze your target. Look at the group, determine its center and see how that measures up to your point of aim. Look at the horizontal spread and distance from the center. Has the group moved with the wind or against it? Does the group appear open and strung out, or tight and just compensated for by the wind call? All this information should help build confidence and fine-tune your dope. If steel is all you have, make sure you paint the plate a color where the shot groups don’t show up as well. Sure, you’ll still hear the hits, but you’ll hopefully refrain from making those micro adjustments that center you up. In a word: Don’t chase the impacts. Dope your rifle first, and try shooting distraction free. Keep your head out of the phone and focus on the fundamentals of marksmanship. 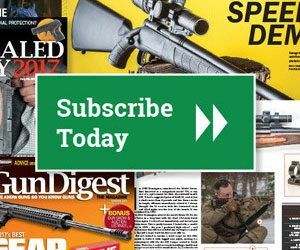 Editor’s Note: This article originally appeared in the 2018 Long-Range Shooting issue of Gun Digest the Magazine.